Move beyond traditional hamburgers with new seasonings and a choice of lean ground beef, lamb, pork, ground chicken or turkey. You can easily transform the ordinary to extraordinary! The idea is to use one or more of the listed ingredients. Experiment a little and come up with your own signature burger! If you can think of an ingredient that’s not on the list feel free to give it a try. Place meat in a bowl and add choice of additional ingredients and seasonings. If using cheese stuff into the middle of each burger making sure the cheese is surrounded by meat. Grill or broil about 4 minutes per side. Cooking over charcoal is always best. 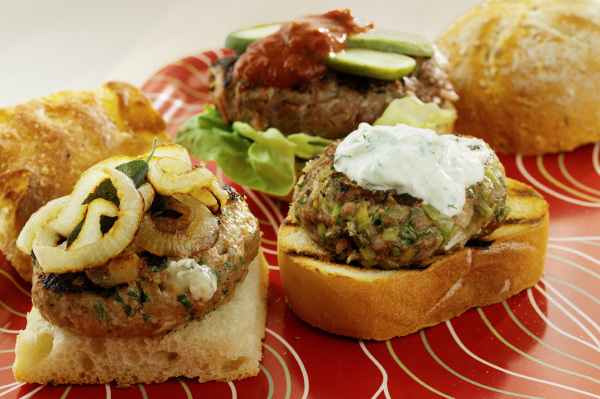 Serve on a sesame seed hamburger bun.